I recently finished Call of the Mild: Learning to Hunt My Own Dinner , by Lily Raff McCaulou. Being an adult-onset hunter myself, I’m fascinated by the stories of others who shared this experience. McCaulou has crossed a cultural chasm, and the story of that crossing reveals much about our cultural landscape. “But the truth is,” she writes, “that’s exactly who I am and what I’m looking for.” She finds it. She also finds a new career, new friends, and new love. And along the way, inspired by Michael Pollan, a vegetarian friend, and her many new friends and neighbors who hunt, she finds a new way to obtain that hunk of meat in the middle of her plate. After a few shooting lessons, her next hurdle is The Shopping Trip. Her stories about condescending male gun shop employees of questionable competence are humorous only in retrospect, and those guys are going to be pretty embarrassed if they read Call of the Mild and recognize themselves. But they didn’t sound like big readers, so it may not be a worry. Over the pages that follow, McCaulou also gives readers far more positive glimpses into hunting culture and the role hunting plays in wildlife conservation. Non-hunting readers are likely to finish her book with a greater acceptance and tolerance of hunting, and hunters will enjoy most of those passages, too. Hunters will also find fascinating this glimpse into how they and their culture are viewed by outsiders and newcomers. 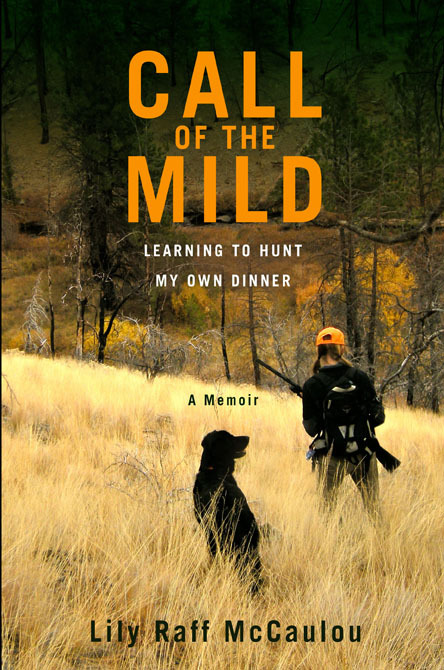 Call of the Mild: Learning to Hunt my Own Dinner is subtitled A Memoir, and it’s a deeply personal one. It’s a hunting story, but it’s also a love story, and a story about other pivotal life events that McCaulou experiences during this period. Not all of them are happy ones. On balance, however, Call of the Mild is a fun read. I finished it in one sitting, and it was way more entertaining than whatever might have been on TV that night. I give it two thumbs up. You can visit her website and order your copy right here. Hunting Wolves in Minnesota, Wisconsin, and Michigan: Different From Wyoming, Idaho, or Montana? Good review Al. I’ve heard of the book and of Lily’s story. I look forward to reading her book. I found her notion of hunting being – ‘not as accessible as many would believe’ – to be very insightful. Because it’s true. Hunting in the US and Canada is quickly going the way of European management hunting. This is not happening ‘to us’, so much as we are ‘allowing it to happen’. I am of the opinion that hunting, as we know it today, is unlikely to exist in the next quarter century; if not sooner. I hope this will not be the case, but I am a realist. Of course, in the most remote areas of the country, hunting and fishing will continue as available resources allow. But for areas near human habitation, they will either become devoid of wildlife or inaccessible for such reasons as; political variance, regulations, access, social pressures, etc. The ‘open market’ for outdoor goods and services to the ‘hook-n-bullet’ groups will cease as we know it today. The market will dry up. I don’t look forward to this – but it’s not likely to be avoided. Humanity put into motion, decades ago, actions filled with seriously negative outcomes and the outdoor heritage activities will be severely impacted. Change is inevitable. We can either be run over by it .. or learn to ride it. I have read the book and it’s excellent, so I also recommend it to any of Al’s readers. My “quick review” on Amazon was that the book is really the story of an urban environmental consciousness of global threats to the environment that lacks any understanding of landscapes and the actual daily workings of nature meeting rural conservationist hunters and anglers who have an intimate understanding of their surrounding landscapes and workings of ecosystems. I think, in response to O’fieldstream,: her point about hunting being inaccessible is that the skills to learn aren’t easy and most of the people who hunt don’t have it in their minds of how to bring people in who are interested. I just experienced this teaching a couple hunting classes this last year. Trying to explain deer hunting in a couple hours and set people on a path so that they can do it was a huge challenge. You pick up so many skills through others and your own trial and error that you forget what a skill even “easy” types of hunting are. I believe some democratic tradition of American hunting will continue, but I’m very worried about privatization of hunting, as well as the demographics of hunters as Al mentioned. We do have the ability to stop this trend through recruitment and a strong “hunter and angler” conservation movement that advocates for our interests as well as broader economic, environmental, and social benefits of hunting and angling..